Mickey and Minnie Mouse are ageless, iconic characters that are fun to wear on your nails and there are options for any length. Always apply a base coat before the first color coat to keep the polish from staining the nails and for even coverage. Using a quick drying manicure spray between coats will help speed drying time. Seal with a quality top coat for durability. This design uses a white creme polish as the base color, such as OPI Alpine Snow. Other colors needed are red, black and yellow creme polishes or nail art pens. Use a small detail brush to paint Mickey and Minnie Mouse and a striper brush to paint their joining tails on the middle finger. On the pinky finger, use nail glue on the rhinestones starting at the cuticle area. Alternate red, black and yellow stones diagonally down the nail. Anyone can wear this simple and fun design. Apply two coats of a red creme polish as the base color for four nails and two coats of white polish to the other nail. Use a large dotting tool and white polish to make the polka dots on the red nails. To make Minnie Mouse's head, use either a dotting tool or a small detail brush with black polish to make the head and ears. Use the same red polish and a small detail brush to paint the bows. Alternate colors for this design, using a white creme polish on the index fingers, black on the middle fingers, red creme on the ring fingers and yellow on the pinkies. On the index fingers, use a small detail brush for the head designs and a small dotting tool for the black and white pupils. On the ring finger for the hand with Mickey Mouse, use a large dotting tool to make the yellow buttons and outline them in black using a small detail brush or nail art pen. On the ring finger for the hand with Minnie Mouse, use a medium to large dotting tool for the polka dots in white polish. Start with a pale pink polish, such as OPI Nail Lacquer in Got a Date To-Knight. Use a white polish, such OPI Nail Lacquer in Alpine Snow and a dotting tool to make the polka dots. Use a small detail brush with black polish, such as OPI Nail Lacquer in Black Onyx, to make the head and the same white polish for the bow. This design uses a white and hot pink creme polishes as base colors. Use a small detail brush with hot pink polish for the polka dots on the middle finger. For the mouse head on the pinky finger, use black creme polish and a small detail brush. The thumb, index and ring fingers have 3D nail art pieces attached with nail glue. Nail art pieces such as these can be found on Amazon. This design is a playful take on a French manicure. It can be done with either the traditional clear base coat or a sheer pink base color coat. Use a red creme polish for the tip and a medium dotting tool with white polish for the polka dots. For the bow, use a small detail brush with black creme polish. To make the bow, paint two triangles on the left side of the nail joined with a large dot of black polish. This design is done on nails with a stiletto shape, which means the nails are formed to a sharply pointed tip. The stiletto shape is most often found on artificial nails. The base color for the index and ring fingers is a sheer pink. Both middle fingers use two coats of red polish with red glitter added while the polish is wet. The pinky fingers use a white creme polish with a pearl glitter added to wet polish. 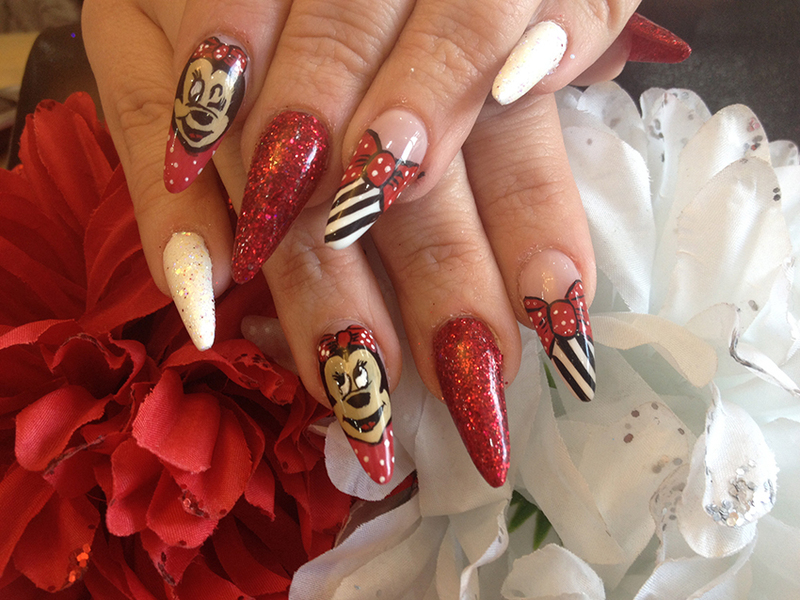 Use a small detail brush and dotting tool on the nail with Minnie Mouse's head. Use the same red, black and white creme polishes to make the diagonal stripes and bows on the other two nails. A striper brush may make the diagonal lines easier to paint. This simple design doesn't require artistic skills since you simply need to apply decals to your base coat. This design starts with two coats of a white creme base color. Full body Mickey Mouse decals make it easy to complete. This design uses a gray creme polish as the base color with a silver or holographic glitter added. Using a red creme polish and hot pink creme polish, alternate red hearts and pink mouse heads with a small detail brush. A heart of each color is placed above a freehand painted Mickey Mouse using a small detail brush with red, black, yellow, and flesh toned polishes. Some nail art supplies may be difficult to find in stores. However, most can be found online easily and inexpensively. All it takes is a little time and creativity.